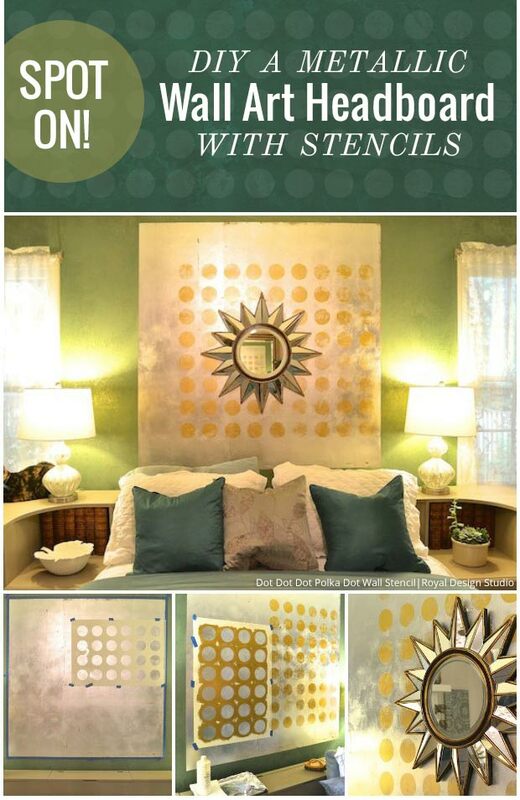 See how to stencil shimmering spots of gold metallic foil to create one of a kind wall art. Our master bedroom furniture is Danish Modern: a platform bed and two large dressers. All very angular. This year I refinished the original teak, which seemed to turn more orange every year. After 30 years, I decided to give myself permission to paint it all. 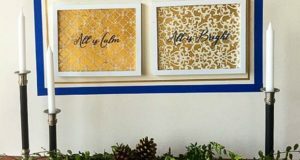 We love the new look that isn’t so “in your face,” but everything in the room is still quite angular, including the imitation silver leaf accent square I added a couple of years ago. It’s the perfect spot to hang a focus piece, like art or a mirror, but I have been craving something round. Though I can’t say I’ve ever been a huge polka dot fan, they have been growing on me. 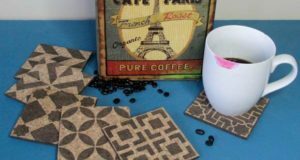 I kept going back to look at Royal Design Studio’s Dot Dot Dot Polkadot Modern Geometric Stencil when I was searching for a pattern to work inside my silver square. It is set up in perfect rows, and being solid, I thought it would show up nicely using Antique Gold Foil. My biggest decision, after choosing the stencil design, was whether or not to apply it perfectly square within the silver area, or go a bit wild, and let it sit off-center. While I admit this look may not suit everyone’s taste, I went for it. I do love some unexpected surprises around the house. Speaking of surprises, you’ll notice that throughout my photos, all three of our rescue kitties were fascinated by the process and wanted their turn in my photos. Your project will be different than mine, but for this project, I used a measuring tape and a level to find the center of a square that I picked on the stencil, and marked it. 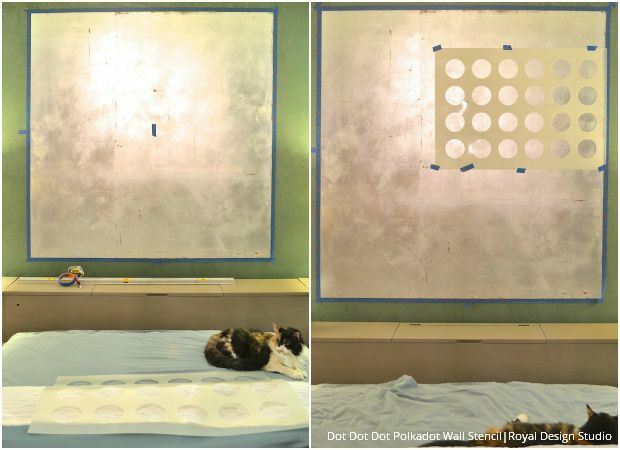 I also taped around the square, not sure yet if the polka dots will run into the wall area. 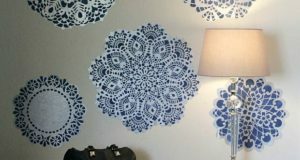 If you want the pattern to appear symmetrical, find the center of the stencil and mark it too. Use a small roller to roll on a thin coat of Wundasize. Wait about ten minutes, and roll another thin coat. 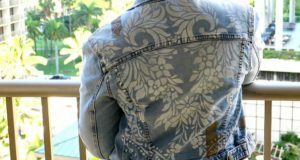 Two coats of size is recommended for metallic foil application. Cut pieces of foil about 18 inches long to make them more manageable. 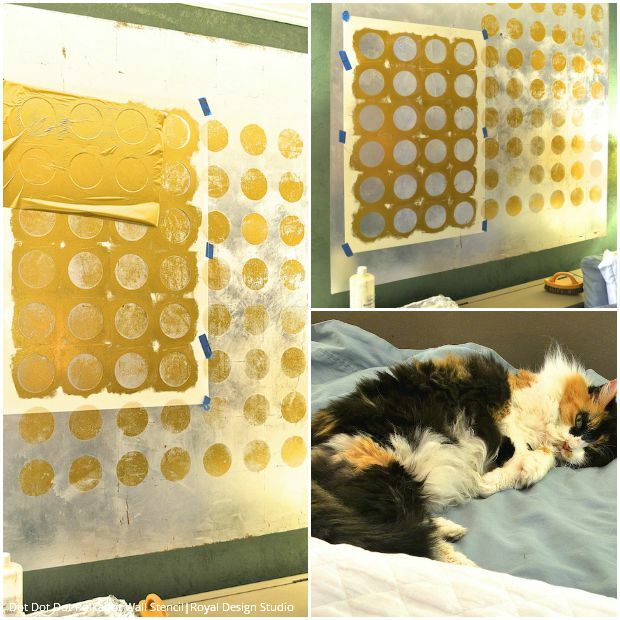 Lay a piece, shiny side UP, over the stencil, and burnish the foil using a stiff brush. When the foil has released, pull up the clear material. Anywhere that the size has not been covered with gold will still accept foil, so you can move the piece of foil around to open areas as needed. I wanted coverage to be non-solid. This is a very easy process, but for my project, it took some time to roll on two coats of size, add foil, then move the stencil and repeat. DO YOU NEED TO SEAL? Since my wall is never handled, or even touched, I did not seal it. But to make sure there is no tackiness remaining, you could seal it with a gloss, non-yellowing sealer like Modern Masters Master Clear or Annie Sloan Clear Soft Wax . Now that Fall is arriving and the kids are back in school, this is the perfect time to tackle your project list. Paint+Pattern is such wealth of diverse inspiration and ideas. 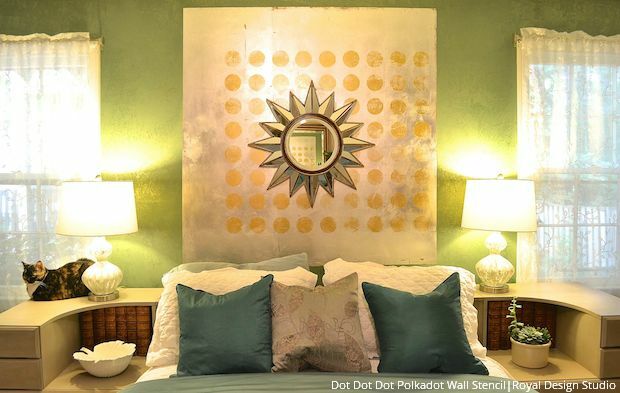 Check out these other great metallic inspired projects from our talented team! This is really wonderful! I love the off center look of the polka dots. I just found your blog, sure glad I did!